Virus indexing programs are common in the horticultural world, not just for hostas, but for most plants where specific pathogens have been previously documented. 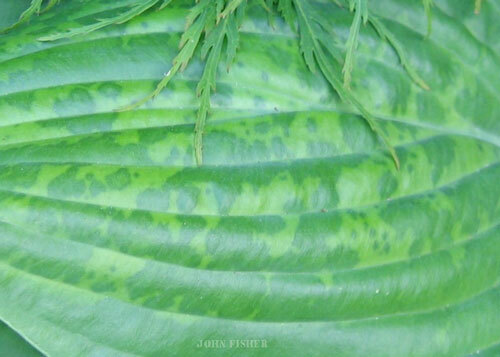 For many years, hosta screens have included testing for the seven viruses known to infect hostas. That is until earlier this year, when yet another hosta virus was confirmed – Tobacco streak virus (TSV). Since February of 2013, Agdia now includes TSV testing as part of their standard hosta screen (Table 1). Agdia, Inc., based in Elkhart, IN, is a world leader in the diagnostic testing of plant pathogens. Their ELISA test strips are used to detect Hosta Virus X (HVX) and other viruses in hostas. 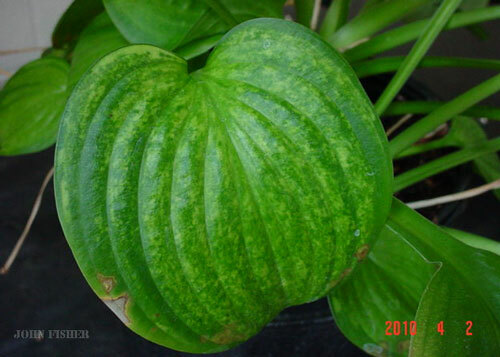 In 2010, a Hosta ‘Fried Green Tomatoes’, displaying a virus-like mottle symptom (defined as a variegated pattern with rounded or diffuse boundaries between light and dark areas) (Fig. 1), was submitted to the Ohio Plant Diagnostic Network for analysis. The sample was collected from a nursery block of approximately 100 plants grown from bare root plugs imported from Europe, and a majority of the plants showed the symptom. 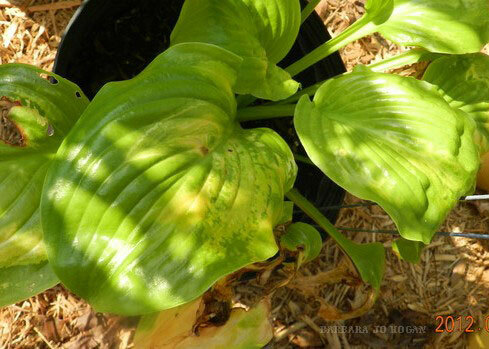 Standard hosta screening tests were performed, but all tests were negative at that time. After two years of further observation, a number of additional “non-standard” hosta pathogen tests were performed. The hosta ultimately tested positive for TSV. TSV is not a new virus in the plant world. It has a wide host range, including both ornamental and food crops, but this was the first time it had been observed in Hosta. The virus is typically spread by thrips feeding or by mechanical means, and most recently has been discovered to infect astilbe. 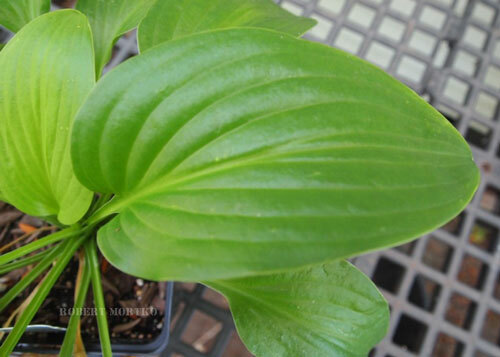 Since adding TSV to their standard hosta screen in February 2013, Agdia has now confirmed the presence of TSV in a number of hosta samples that have been submitted for testing. This may help explain virus-like mottle symptoms in hostas that previously tested negative for the prior standard hosta screen. An observed spike in positive TSV tests does not indicate an epidemic, but is simply the result of a new test for a virus we had not previously screened for. Possibly the most troublesome aspect of TSV in hostas is the plant’s ability to overcome the symptomatic mottle pattern. The plant remains infected with the virus, but can become asymptomatic as time progresses. The ‘Fried Green Tomatoes’ plant, that initially showed a severe mottle symptom in 2010, became less symptomatic or asymptomatic in subsequent years. Likewise, a sample of H. ‘Venus’ showed a mottle pattern in the fall of 2012, but became asymptomatic a year later (Fig. 2). This is all a good reminder that when we say a hosta is “virus free,” we should be more precise in saying that the hosta is free of those specific viruses for which it was tested. No doubt, there will be additional pathogens that are found to affect hostas in the years to come. That is not a message of “doom and gloom” for those of us that grow hostas. It is a just another good reason to keep informed and stay alert.